Walking into Camellia Art Gallery, my eyes gravitate to a work by local artist Louanne LaRoche. Dark charcoal lines on a white backdrop create a compelling contrast, and the subjects in the piece transform into characters playing out a story in my mind. I hear the laughter, chatter and clank of glasses as a small group of Southern women enjoy gossip and an afternoon tea. A seemingly tired African American woman sits off to the side. A white scarf covers her hair, and the lines LaRoche used to create the folds on her white smock remind me of the drooping limbs of an old oak tree. These women are from a long gone but not forgotten time. These women are a portal to my past as a Lowcountry native. And these women remind me why people—permanent residents, part-timers or visitors—appreciate and collect Hilton Head and Bluffton art. Work like LaRoche’s serves as an aesthetic memento of an area that captures so many, visually, historically and spiritually. Her work is also contributing greatly to the continued success and progression of our local art scene. 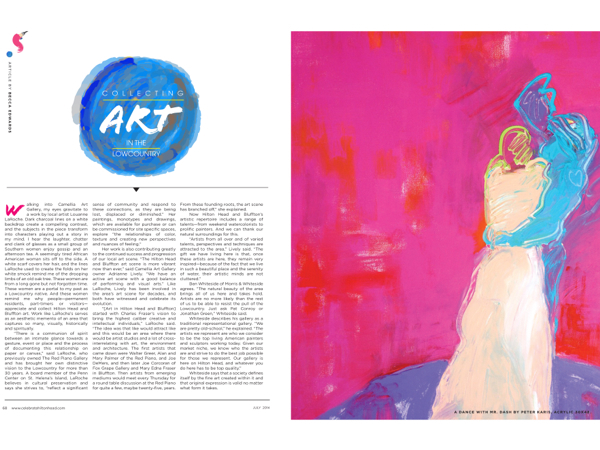 “The Hilton Head and Bluffton art scene is more vibrant now than ever,” said Camellia Art Gallery owner Adrianne Lively. “We have an active art scene with a good balance of performing and visual arts.” Like LaRoche, Lively has been involved in the area’s art scene for decades, and both have witnessed and celebrate its evolution. “[Art in Hilton Head and Bluffton] started with Charles Fraser’s vision to bring the highest caliber creative and intellectual individuals,” LaRoche said. “The idea was that like would attract like and this would be an area where there would be artist studios and a lot of cross-interrelating with art, the environment and architecture. The first artists that came down were Walter Greer, Alan and Mary Palmer of the Red Piano, and Joe DeMers, and then later Joe Corcoran of Fox Grape Gallery and Mary Edna Fraser in Bluffton. Then artists from emerging mediums would meet every Thursday for a round table discussion at the Red Piano for quite a few, maybe twenty-five, years. From these founding roots, the art scene has branched off,” she explained. 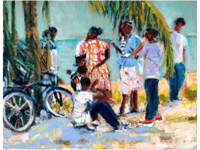 Now Hilton Head and Bluffton’s artistic repertoire includes a range of talents—from weekend watercolorists to prolific painters. And we can thank our natural surroundings for this. Ben Whiteside of Morris & Whiteside agrees. “The natural beauty of the area brings all of us here and takes hold. Artists are no more likely than the rest of us to be able to resist the pull of the Lowcountry. Just ask Pat Conroy or Jonathan Green,” Whiteside said. Whiteside says that a society defines itself by the fine art created within it and that original expression is valid no matter what form it takes. As an artist and a previous gallery owner, LaRoche has some keen words of advice when it comes to buying art. “Art is very personal. It serves to elevate existence in this world and to visually be able to pass something that uplifts you. For me as a visual artist, I think that this is important to do,” she said. LaRoche also recommends that you attend art openings “to start communication and to get to know the artists and develop a rich relationship.” Locals and visitors alike can do this by subscribing to galleries’ mailing lists and then coordinating their calendars with upcoming events. 2. The Art League of Hilton Head – The Art League of Hilton Head, located at 14 Shelter Cove Lane, at the Arts Center of Coastal Carolina’s Walter Greer Gallery is proud to be the only non-profit visual arts organization on Hilton Head. Representing over 100 locally based artists who possess diverse backgrounds and a multitude of inspirations, the Art League offers a new exhibition monthly. We invite all residents and visitors to come and enjoy an amazing collection of art and take home a piece of Hilton Head. Please check our website, www.artleaguehhi.org, for more information. Exhibitions and reception events are always free and open to the public. 5. Revival Design and Decor (124 Arrow Road, Suite 5) Hilton Head’s newest destination for furniture, home accessories and gifts unlike anything you have seen. What if we told you your dining room could have a brand new look in one afternoon and for less than $100? What if we told you it would look better than what you might find in the latest home magazine or brand name furniture store? What if we told you it was easy and empowering? We promise all three and look forward to showing you how! 7. Karis Art Gallery (1000 William Hilton Parkway in Village at Wexford) Karis Art Gallery is proud to represent American contemporary artists with a wide diversity of styles and mediums. Our goal is to be a showcase for the talented..in painting, photography, fine jewelry, glass and art wearables. Artists represented include Peter Max, Peter Karis, Linda Hartough, John K. Crum, The Art of Dr. Seuss, Guido Petruzzi, David Ryden, David Wendel and many others.Recently voted “Favorite Hilton Head Art Gallery for 2014” no trip to Hilton Head Island is complete without enjoying the vibrant world of color and life at the Karis Art Gallery. 12. SoBA Gallery (corner of Church and Calhoun in Bluffton) The Society of Bluffton Artists is a non-profit organization established to promote a stimulating community environment for the visual arts. Open 10 am – 5 pm Monday through Saturday, 11:30 am – 3 pm Sunday, the Gallery features a dynamic new show every month, each with a theme or featured artist, plus the new work of over 100 hanging artists. In addition to the gallery, SOBA has a learning center providing art classes at no-cost for the students in our school district. SOBA’s Center for Creative Arts schedules art classes and workshops for adults with top quality art instructors year round.